Home » » CONFIRMED Starting Xl: Arsenal-CSKA Moscow And Predicted Score. CONFIRMED Starting Xl: Arsenal-CSKA Moscow And Predicted Score. 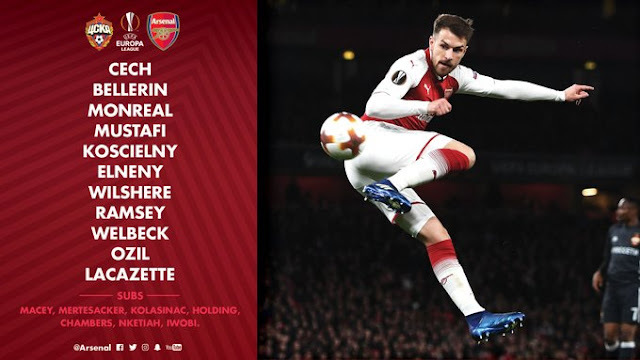 Arsenal have officially revealed their starting Xl that will be playing against CSKA Moscow in the second leg of the UEFA Europa League group quarter-finals. Arsenal are suffering from several absences such as the Armenian international Henrikh Mkhitaryan, the Colombian international David Ospina, and finally the Swiss international Granit Xhaka. Defenders: Nacho Monreal, Shkodran Mustafi, Calum Chambers, and Hector Bellerin. Midfielders: Granit Xhaka, and Mohamed Elneny. Arsenal should be able to beat CSKA Moscow if they play with the same intention and style as they played in the first leg at home, but Arsene Wenger should be aware that CSKA Moscow could make another comeback this week after A.S. Roma and Juventus made historical comebacks. However, we expect a 2-1 win for Arsenal and qualification for the semi-final.